The Cove is a 2009 documentary film directed by Louie Psihoyos which analyzes and questions dolphin hunting practices in Japan. It was awarded the 2010 Oscar for Best Documentary Feature in 2010. The film is a call to action to halt mass dolphin kills, change Japanese fishing practices, and to inform and educate the public about the risks, and increasing hazard, of mercury poisoning from dolphin meat. The film is told from an ocean conservationist's point of view. The film highlights the fact that the number of dolphins killed in the Taiji dolphin drive hunting is several times greater than the number of whales killed in the Antarctic, and asserts that 23,000 dolphins and porpoises are killed in Japan every year by the country's whaling industry. The migrating dolphins are herded into a cove where they are netted and killed by means of spears and knives over the side of small fishing boats. The film argues that dolphin hunting as practiced in Japan is unnecessary and cruel. The film was directed by former National Geographic photographer Louie Psihoyos. Portions were filmed secretly in 2007 using underwater microphones and high-definition cameras disguised as rocks. The documentary won the U.S. Audience Award at the 25th annual Sundance Film Festival in January 2009. It was selected out of the 879 submissions in the category. 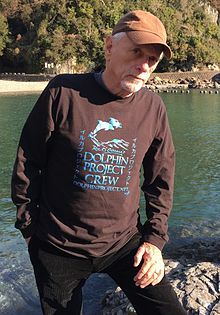 The film follows former dolphin trainer and activist Ric O'Barry's quest to document the dolphin hunting operations in Taiji, Wakayama, Japan. In the 1960s, O'Barry helped capture and train the five wild dolphins who shared the role of "Flipper" in the hit television series of the same name. The show, very popular, fueled widespread public adoration of dolphins, influencing the development of marine parks that included dolphins in their attractions. After one of the dolphins, in O'Barry's opinion, committed a form of suicide in his arms by closing her blowhole voluntarily in order to suffocate, O'Barry came to see the dolphin's captivity and the dolphin capture industry as a curse, not a blessing. Days later, he was arrested off the island of Bimini, attempting to cut a hole in the sea pen in order to set free a captured dolphin. Since then, according to the film, O'Barry has dedicated himself full-time as an advocate on behalf of dolphins around the world. After meeting with O'Barry, Psihoyos and his crew travel to Taiji, Japan, a town that appears to be devoted to dolphins and whales. In a nearby, isolated cove, however, surrounded by wire fences and "Keep Out" signs, an activity takes place that the townspeople attempt to hide from the public. In the cove, a group of Taiji fishermen engage in dolphin drive hunting. The film states that the dolphin hunt is, in large part, motivated by the tremendous revenue generated for the town by selling some of the captured dolphins, female bottlenose dolphins, to aquariums and marine parks and killing the majority of the rest. The dolphins that are not sold into captivity are then slaughtered in the cove and the meat is sold in supermarkets. According to the evidence presented in the film, the local Japanese government officials are involved in the hiding of the hunting, and the Japanese public is not fully aware of the hunt and the marketing of dolphin meat. The film states that the dolphin meat contains dangerously high levels of mercury and interviews two local politicians, Taiji city councilors who have, for that reason, advocated the removal of dolphin meat from local school lunches. Attempts to view or film the dolphin killing in the cove are physically blocked by local police and the Japanese local government who treat the visitors with open intimidation, derision, and anger. Foreigners who come to Taiji, including The Cove's film crew, are shadowed and questioned by local police. In response, together with the Oceanic Preservation Society, Psihoyos, O'Barry, and the crew utilize special tactics and technology to covertly film what is taking place in the cove. The film also reports on Japan's alleged "buying" of votes of poor nations in the International Whaling Commission. The film indicates that while Dominica has withdrawn from the IWC, Japan has recruited the following nations to its whaling agenda: Cambodia, Ecuador, Eritrea, Guinea-Bissau, Kiribati, Laos, and the Republic of the Marshall Islands. [a] At the end of the film, O'Barry shows footage of the Taiji dolphin slaughter to a Japanese official, after the official repeatedly denies the incident; he is unmoved by the footage and asks O'Barry where he obtained it. The film then cuts to a scene showing an annual meeting of the International Whaling Commission. O'Barry marches into a meeting of the Commission strapping a TV showing the footage on his chest (while the Japanese delegates are talking about how they have improved whaling tactics). O'Barry walks around the crowded meeting room displaying the images until he is escorted from the room. Today they would kill me, if they could. And I'm not exaggerating, if these fisherman could catch me and kill me, they would. ―Ric O'Barry, In the first five minutes of the film. The film used specialized camouflaged high-definition cameras that were designed to look like rocks. These hidden cameras helped capture footage and were so well camouflaged that, according to director Louie Psihoyos, the crew had a hard time finding them again. They also used a high grade military thermal camera and different night vision cameras in the production of the documentary. The film received predominately positive reviews from critics. Roger Ebert gave the film four stars (out of four), calling the film "a certain Oscar nominee". Jeannette Catsoulis of The New York Times called the film "an exceptionally well-made documentary that unfolds like a spy thriller", going on to describe it as "one of the most audacious and perilous operations in the history of the conservation movement". Other reviewers also played up the espionage angle of the film, including Time magazine's Mary Pols who said that The Cove "puts Hollywood capers like Mission Impossible to shame", and Peter Rainer of The Christian Science Monitor, who called it "a rousing piece of real-world thriller filmmaking". Film review aggregator Rotten Tomatoes reported that 94% of critics had given the film positive reviews, based upon 125 total reviews, summarizing the consensus as "Though decidedly one-sided, The Cove is an impeccably crafted, suspenseful exposé of the covert slaughter of dolphins in Japan." At Metacritic, which assigns a normalized rating out of 100 to reviews from mainstream critics, the film has received an average score of 82, based on 26 reviews. Some reviews recognized the film's entertainment value but did not view it as an "objective documentary". Wall Street Journal critic Joe Morgenstern labeled the film as a "quasidocumentary framed as a high-tech thriller" with an "agitprop style" that had "an excess of artifice and a dearth of facts". David Cox of The Guardian Film Blog called it a "piece of evangelism", and asked rhetorically: "Westerners... kill and eat cows. Easterners eat dolphins. What's the difference?". According to Michelle Orange of Movie Line "How much of this (The Cove) should we believe? As a piece of propaganda, The Cove is brilliant; as a story of ingenuity and triumph over what seems like senseless brutality, it is exceptionally well-told; but as a conscientious overview of a complex and deeply fraught, layered issue, it invokes the same phrase as even the most well-intentioned, impassioned activist docs: Buyer beware." The whale and dolphin hunting season in Japan usually begins on September 1 each year; in 2009, the hunting began on September 9. Although activists tend to believe that it was because of the publicity generated by the film, it has been reported that the delay was due to the weather and rough seas. According to campaigners, out of the 100 dolphins captured on September 9, some were taken to be sold to marine museums and the rest were released, while 50 pilot whales were killed and sold for meat on the same day. While campaigners claim that it has become apparent that The Cove is having an impact on the way in which Japanese fisherman normally conduct the dolphin hunt, on March 23, 2010, the Japanese government stated "The dolphin hunting is a part of traditional fishery of this country and it has been lawfully carried out." Upon the film winning the Oscar, the town mayor of Taiji and the chief of Taiji Fishery Union said "The hunt is performed legally and properly with the permission of Wakayama Prefecture [local government]." Taiji assemblyman Hisato Ryono, one of the two local legislators who broke ranks and publicly called for removal of dolphin meat from school lunches, said he was lied to by the documentary's producers about what the film would contain. Since the release of the film, a much larger number of activists, mainly non-Japanese, have visited Taiji to protest or film the dolphin hunts. The Taiji fishermen responded by constructing an elaborate structure of tarps to better conceal the drive-hunting activities in and around the cove. SeaWorld spokesperson Fred Jacobs has responded by saying that, "We think we're being unfairly criticized for something we're opposed to." He adds that, "SeaWorld opposes the dolphin hunts documented in The Cove. We do not purchase any animals from these hunts. More than 80 percent of the marine mammals in our care were born in our parks. We haven't collected a dolphin from the wild in decades." However, Jacobs does not condemn those who purchase from the Taiji dolphin hunt. O'Barry has thus been criticized for emphasizing that dolphinariums are a large contributing factor to the economic success of the dolphin slaughter in Taiji and for encouraging boycotts of dolphin shows to protest the dolphin slaughter. The scene in The Cove that displays a map consisting of arrows emanating from Taiji and pointing to countries with dolphinariums has been said to be misleading since the majority of those countries do not currently have dolphins of Japanese origin. However, there is no proof to prove, or disprove these claims. In the United States it is currently illegal to import dolphins obtained from a drive, including the drive hunt at Taiji, as it is considered an inhumane method. Since 1993 there have been no permits issued to facilities in the United States to import dolphins acquired through drive hunt methods. Marilee Menard, the executive director of the Alliance of Marine Mammal Parks and Aquariums, has also stated that she believes that the filmmakers are "misrepresenting that the majority of zoos and aquariums with dolphins around the world are taking these animals." In August 2009, after the screening of the film in Sydney, Melbourne and Brisbane film festivals, the councillors of the Shire of Broome, Western Australia, voted unanimously to suspend its sister city relationship with the Japanese whaling port town of Taiji, as long as the latter continues its dolphin slaughter. The decision was reversed in October 2009. The film was initially screened only at two small venues in Japan: at the Foreign Correspondents' Club in Tokyo in September 2009, and at the Tokyo International Film Festival in October 2009 where it received mixed reviews. A Japanese film distributor, Medallion Media/Unplugged, subsequently acquired the rights to screen the film in Japan. The company hoped to begin a run of the movie in Japanese cinemas in June 2010. Medallion prepared the documentary for presentation in Japan by pixelating the faces of Taiji residents and fishermen depicted in the film. Nationalist protesters vowed to block the release of the film in Japan and dozens equipped with loudspeakers have demonstrated outside of the distributor's office in central Tokyo. As of June 2010, the controversy over the film and the film's subject had received little press attention in Japanese-language media in Japan. Boyd Harnell of the Japan Times stated on May 23, 2010, that Japanese news editors had told him that the topic was "too sensitive" for them to cover. In April 2010, Colonel Frank Eppich, the United States Air Force commander of Yokota Air Base, located near Tokyo, banned screenings of the film at the base theater. A base spokesman said that The Cove was banned because using a base venue to display the film could be seen as an endorsement of the film. The spokesman added, "We have a lot of issues with Japan ... and anything done on an American base would be seen as an approval of that event." In response, Louie Psihoyos said that he would give away 100 DVD copies of the film free to Yokota base personnel. A screening scheduled for June 26, 2010 at Theater N in Shibuya was canceled after staff were harassed by right-wing protesters. Unplugged stated that it was in negotiations with other theaters to screen the film. Another theater in Tokyo and one in Osaka subsequently declined to screen the film. In response, a group of 61 media figures, including journalist Akihiro Ōtani and filmmaker Yoichi Sai, released a statement expressing concern over the threat to freedom of speech by the intimidation of right-wing groups. The Directors Guild of Japan also asked theaters not to stop showing the film, arguing that "such moves would limit opportunities to express thoughts and beliefs, which are the core of democracy." On June 9, 2010, Tsukuru Publishing Co. sponsored a screening of the film and panel discussion at Nakano Zero theater in Nakano, Tokyo. The panelists included five who had signed the statement above. Afterwards, panel member Kunio Suzuki, former head of Issuikai, an Uyoku dantai (rightist) group, condemned the right-winger's threats against theaters and urged that the film be shown. "Not letting people watch the movie is anti-Japanese", said Suzuki. In response to the cancellation of screenings of the film in Japan, Japanese video sharing site Nico Nico Douga screened the film free on June 18, 2010. The same week, Ric O'Barry was invited to speak at several universities in Japan about the film. O'Barry stated that he was planning on bringing several Hollywood stars to Taiji in September 2010 in an attempt to halt that year's hunt. On July 3, 2010, six theaters in Sendai, Tokyo, Yokohama, Kyoto, Osaka, and Hachinohe began screening the film. Right-wing nationalists protested outside four of the theaters, but close police supervision prevented any disruption to the viewing schedules and ensured free access for viewers to the theaters. The two in Tokyo and Yokohama were successful in obtaining prior court injunctions prohibiting protests outside their venues. A local Taiji activist group, called People Concerned for the Ocean, announced that they would distribute DVDs of the film, dubbed in Japanese, to all 3,500 residents of Taiji. The DVDs were to be distributed to the residents on March 5–6, 2011. There has been some controversy over the depiction of some of the Japanese people in the film. Hirotaka Akamatsu, Japanese Minister of Agriculture and Fisheries, said "it is regrettable that this movie is made as a message that brutal Japanese are killing cute dolphins". However, upon questioning, director Louie Psihoyos said of his sympathy for the Japanese people, many of whom are unaware of the situation at the cove, "To me, it's a love letter. I'm giving you the information your government won't give you." This did not sway critics who saw the movie and stated that "Not since Mr Osato accidentally killed a beautiful woman with poison that was intended for James Bond in You Only Live Twice have Japanese people been depicted so one-dimensionally on celluloid." Close-up Gendai, an investigative journalism program on NHK, reported questions raised regarding the objectivity of the filming. One scene in the film was presented as having been manufactured for the camera. The segment then entered into a discussion with a commentator on whether the movie should properly be called a documentary. Louie Psihoyos, the documentary's director was interviewed by Close-up Gendai, but no response was broadcast regarding the allegedly scripted and acted scene. Elsewhere, Psihoyos has stated categorically that none of the scenes in the film were staged. Tetsuya Endō, an associate professor of the Health Sciences University of Hokkaido has complained that the film has approached him under false pretenses. In one scene, he is actually holding a sample of dolphin liver (containing an anomalously high 2000 ppm level of mercury), but the film represented it as dolphin meat bought in Taiji. [c][d] In reality, the town's fishermen's union banned sales of the liver in 2003 at the professor's prompting. Endo sought to have his scenes removed, but initial screenings went ahead without, and he sued the Japanese rights-holder, Medallion Media, and the distributor, Unplugged, for ¥11 million for damages to his reputation. The litigation opened in Tokyo District Court on December 1, 2010. In 2015, filmmaker Keiko Yagi [ja] released a documentary titled Behind 'The Cove' [ja] which presented the side of the Taiji fishermen. The film was screened at the Montreal World Film Festival. The Cove has won over 25 film awards. Some notable awards include "Best Documentary" from the Environmental Media Awards, Three Cinema Eye Honors for "Outstanding Achievement", and the Academy Award for Best Documentary Feature on the 82nd Annual Academy Awards. 82nd Academy Awards (2010) – Best Documentary Feature (won) During the presentation ceremony, ABC cameras abruptly cut away to the crowd when O'Barry raised a banner urging the audience to "Text DOLPHIN to 44144". TV Guide labeled the moment as "Fastest Cutaway", and film critic Sean Means wrote it showed that the Oscar ceremony was "studiously devoid of genuine excitement". Traveling through film festivals and social events all around the United States, The Cove has also received the best documentary nod from many critics organizations, including The Boston Society of Film Critics, San Diego Film Critics Society, Dallas/Ft. Worth Film Critics Association, Utah Film Critics Association, Florida Film Critics Association, Houston Film Critics Association, and the Denver Film Critics Society. As the film has received more and more recognition, the Oceanic Preservation Society translated their website into multiple languages to cater to interest from around the world. ^ This is not entirely accurate, however, as Ecuador has been a strong opponent of whaling. ^ A different program broadcast 1 year after than the Close-up Gendai segment. It captures footages of the activists as they irritate local people by saying nasty words both in Japanese and English, and shove cameras at their faces. ^ The subtitle in the film read: "This is dolphin meat. This is containing 2000ppm". ^ Endo's findings on the 2000 ppm liver can be confirmed in a report for fiscal purpose, which also cites publication in a peer-reviewed journal. ^ Psihoyos, in video-conference interview to Close-up Gendai attributed the information to Akira Nakamae, the Deputy Minister of Fisheries, whom he met on an airplane bound for Santiago, where the 2008 IWC meeting was being held Psihoyos conceded he may have misapprehended and what was actually said might have been that he was "moved" (at around 20:00 minutes into the program). Nakamae when contacted by NHK stated he "never gave the reply that [Moronuki] was fired" (at around 22:00 minutes). ^ The Cove (2009). 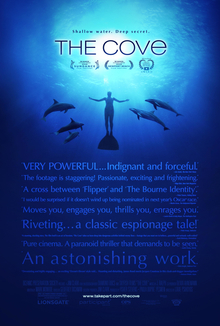 "The Cove Poster". Impawards.com. Retrieved April 23, 2010. ^ a b c "Dolphin slaughter film a hit at Sundance" The Japan Times. (January 27, 2009). Retrieved on January 27, 2009. ^ Catsoulis, Jeannette. The Cove (2008) From Flipper's Trainer to Dolphin Defender The New York Times. July 31, 2009. ^ Jurgensen, John. A Dolphin Horror Film The Wall Street Journal. July 31, 2009. ^ "SaveJapanDolphins.org". SaveJapanDolphins.org. Retrieved April 23, 2010. ^ "TheCoveMovie.com". TheCoveMovie.com. Retrieved April 23, 2010. ^ "Ecuador ECUADOR PROPONE PONER FIN A LA "CAZA CIENTÍFICA" QUE JAPÓN REALIZARÁ EN SANTUARIO AUSTRAL". Ministerio de Relaciones Exteriores del Ecuador. February 17, 2011. Retrieved September 21, 2010. ^ "Ecuador has not joined the pro-whaling block in the IWC". Sea Shepherd. August 11, 2010. Archived from the original on October 18, 2010. Retrieved September 21, 2010. ^ "Scott Baker | Marine Mammal Institute". Mmi.oregonstate.edu. Retrieved April 23, 2010. ^ Catsoulis, Jeannette (July 31, 2009). "Movie Review - The Cove - From Flipper's Trainer to Dolphin Defender". Movies.nytimes.com. Retrieved August 28, 2009. ^ Pols, Mary (August 10, 2009). "Documentary Review: The Cove". TIME. Retrieved August 28, 2009. ^ Rainer, Peter (August 7, 2009). "Review: 'The Cove'". csmonitor.com. Retrieved August 28, 2009. ^ "The Cove Movie Reviews, Pictures". Rotten Tomatoes. IGN Entertainment, Inc. Retrieved August 12, 2015. ^ "Cove, The reviews at Metacritic.com". Metacritic. CNET Networks, Inc. Retrieved November 24, 2009. ^ Kennicott, Philip (August 7, 2009). "Mini Movie Review: 'The Cove'". Washington Post. ^ Cox, David (October 26, 2009). "The Cove's message is gruesome but facile". The Guardian. Retrieved April 23, 2010. ^ From Lowbrow (July 30, 2009). "MovieLine.com". MovieLine.com. Archived from the original on August 3, 2009. Retrieved April 23, 2010. ^ "Hunters Pass On Opening Day Of Dolphin Season". All Things Considered. NPR. September 5, 2009. Retrieved September 7, 2009. ^ イルカとクジラ捕獲 太地の追い込み漁 (in Japanese). Kii Mimpō (紀伊民報). September 9, 2009. Archived from the original on September 12, 2009. Retrieved April 23, 2010. ^ Conservationists say 70 dolphins in Japan released. Associated Press. September 15, 2009. ^ イルカ漁は「法令に基づく伝統的漁業」 「ザ・コーブ」踏まえ政府が答弁書決定 [Dolphin whaling is 'legally compliant traditional fishing': government decides on response in writing, in consideration 'The Cove'] (in Japanese). Sankei.jp.msn.com. March 23, 2010. Archived from the original on August 3, 2012. Retrieved April 23, 2010. ^ Professor Endo is also named (in the Jay Alabaster article) as an individual who complained that the film's makers approached him under false pretenses. But he teaches at a university in Hokkaido, not Taiji. ^ Harnell, Boyd (August 1, 2007). "Taiji officials: Dolphin meat 'toxic waste' Assembly pair break taboo, warn of acute mercury risk in school lunches". The Japan Times. ^ a b Alabaster, Jay, (Associated Press), "Cove Oscar Won't End Taiji Dolphin Kill", Japan Times, March 20, 2010, p. 2. ^ Alabaster, Jay (March 3, 2011). "Activists may shift tactics in Taiji; Sigh of relief". Japan Times. Associated Press and Kyodo News. ^ Rose, Naomi A. (2009). "The Case Against Marine Mammals in Captivity" (PDF). E.C.M. Parsons, and Richard Farinato. The Humane Society of the United States and the World Society for the Protection of Animals. Retrieved June 7, 2011. ^ "Dolphin Kill Film to Shock Taiji Sister City Broome". Theaustralian.news.com.au. Retrieved April 23, 2010. ^ Debbie Guest (August 23, 2009). "Broome Suspends Sister City Relationship with Taiji Over Dolphin Slaughter". Theaustralian.news.com.au. Archived from the original on August 27, 2009. Retrieved April 23, 2010. ^ 太地のイルカ漁描く映画「The Cove」日本公開を期待 [Film 'The Cove' depicting dolphin hunt in Taiji: theater release in Japan anticipated] (in Japanese). News.janjan.jp. August 27, 2009. Archived from the original on January 7, 2010. Retrieved April 23, 2010. ^ "Australian Town Embraces Taiji Again". The Japan Times. October 15, 2009. Retrieved October 28, 2009. ^ Tabuchi, Hiroko (October 22, 2009). "Film on the Dolphin Hunt Stirs Outrage in Japan". The New York Times. Retrieved February 9, 2010. ^ a b "Right-wingers vow to block release of 'The Cove' in Japan". Associated Press. April 10, 2010. Retrieved April 10, 2010. ^ Matsutani, Minoru (February 13, 2009). "Distributor Hopes to Screen The Cove Soon". Japan Times. ^ a b "'Cove' director reacts to base ban". Japan Times. Associated Press. April 23, 2010. ^ Harnell, Boyd (May 23, 2010). "Experts fear Taiji mercury tests are fatally flawed". Japan Times. p. 12. ^ Harnell, Boyd (April 13, 2010). "Yokota base bans 'Cove' to be neutral". Japan Times. ^ "Japan screens controversial film". The Straits Times. Agence France-Presse. June 4, 2010. ^ "'Cove' censure threatens free speech: writers, filmmakers". Japan Times. Kyodo News. June 9, 2010. p. 3. ^ Bassett, Deborah (July 6, 2010). "The Cove Opens in Tokyo With Clash From Protesters". Huffington Post. Retrieved January 6, 2011. ^ Matsutani, Minoru (June 11, 2010). "Rightist also tells theaters to run 'Cove'". Japan Times. p. 2. ^ "Nico Nico Doga plans to stream 'Cove' for free". Japan Times. Associated Press. June 17, 2010. p. 2. ^ "Public screenings of 'The Cove' begin". Japan Times. Kyodo News. July 4, 2010. ^ Matsutani, Minoru (March 1, 2011). "Activists to give Taiji residents free 'Cove' DVD". Japan Times. p. 2. ^ "農林水産省/赤松農林水産大臣記者会見概要" [MAFF/Agriculture Minister Akamatsu's press conference (summary)]. Maff.go.jp. Retrieved April 23, 2010. ^ "Japan defends dolphin hunt in Oscar-winning 'Cove'". CTV News. Associated Press. March 8, 2010. ^ a b Kuniya, Hiroko (July 6, 2010). 問われる表現 イルカ漁映画 [Dolphin hunt film: its approach to expression being questioned]. Close-up Gendai (television production) (in Japanese). NHK. ^ クジラと生きる [Living with Whales] (in Japanese). May 22, 2011. ^ Powell, Bill (March 27, 2014). "A Social Media Storm Descends on Taiji, the Japanese Town at the Center of a Dolphin Slaughter". Archived from the original on March 28, 2014. ^ Kyodo News, "Professor in 'Cove' sues film firms over arbitrary editing", Japan Times, December 2, 2010. ^ "EMA – 20th Anniversary Awards". Ema-online.org. Archived from the original on September 22, 2009. Retrieved April 23, 2010. ^ "'The Cove' Tops Cinema Eye Honors". indieWIRE. Retrieved April 23, 2010. ^ "Oscar.com – Oscar Night – Winners". Oscar.go.com. Retrieved April 23, 2010. ^ "Nominees for the 82nd Academy Awards" Archived 2010-04-19 at WebCite. Retrieved February 11, 2010. ^ "2010 Writers Guild Award Winners". TV Source Magazine. February 21, 2010. Retrieved February 20, 2019. ^ DGA Website:"Kathryn Bigelow wins DGA Feature Film Award for The Hurt Locker. Other winners of 2009 DGA Awards announced." (January 31, 2010) Archived February 3, 2010, at the Wayback Machine. Retrieved January 31, 2010. ^ The Japan Times: "'Cove' named best documentary" (January 19, 2010). Retrieved January 19, 2010. ^ King, Susan (December 13, 2009). "L.A. Film Critics announce 2009 winners [Updated]". Los Angeles Times. ^ a b "Toronto Film Critics Association Awards 2009". torontofilmcritics.com. December 16, 2009. Archived from the original on March 23, 2010. Retrieved April 23, 2010. ^ "Newport Beach Film Festival". Newportbeachfilmfest.com. Retrieved April 19, 2014. ^ "BSFC Award Winners – Recent". Thebsfc.org. Retrieved April 23, 2010. ^ "San Diego Film Critics Society – Movie Reviews by San Diego's Top Film Critics". Sdfcs.org. Retrieved April 23, 2010. ^ Robinson, Anna (December 17, 2009). "Dallas-Ft. Worth Film Critics Awards 2009". Altfg.com. Retrieved April 23, 2010. ^ Montgomery, Steve (December 18, 2009). "Utah Film Critics Awards 2009". Altfg.com. Retrieved April 23, 2010. ^ "Florida Film Critics Circle – Home". Floridafilmcriticscircle.webs.com. Archived from the original on December 27, 2009. Retrieved April 23, 2010. ^ "The Hurt Locker wins top award from Houston film critics – 2009-Dec-19 – CultureMap Houston". Culturemap.com. Retrieved April 23, 2010. ^ "Denver Film Critics Society 2009–2010 Award Nominations | Denver Film Critics Society". Denverfilmcritics.org. January 13, 2010. Archived from the original on January 14, 2016. Retrieved April 23, 2010. ^ "Welcome". The Cove Movie. Retrieved April 23, 2010. Oscar-Winning Doc The Cove – video report by Democracy Now!